The Alvin Ailey American Dance Theatre in Rennie Harris’ ‘Lazarus.’ Photo by Paul Kolnik. Introducing the performance of the Alvin Ailey Dance Theater’s 60th anniversary season at the Kennedy Center, the company’s artistic director, Robert Battle, spoke of Mr. Ailey’s seminal legacy. “When so much divides us, Alvin Ailey reflects our common humanity,” he said. His words were born out by a program that showcased Mr. Ailey’s iconic, viscerally expressive artistry, and the way his work inspires and fuels a new generation of modern dance. The first part of the show featured a startling D.C. premiere, “Lazarus,” by the company’s artist-in-residence, Rennie Harris. Harris is the founder of Rennie Harris Puremovement, a hip-hop dance theatre company. The program, commissioned in honor of the company’s anniversary, and co-commissioned by the Kennedy Center, is the company’s first two-act ballet. Created as a tribute to Mr. Ailey’s life and work, the piece fittingly examines ideas of racial inequality, resurrection and new possibility. Opening on a stage painted in shadows, we see one man being held up by another. The action centers on the man inside the embrace, and his journey, historical and emotional. Harris’s complex choreography layers movement like music – as some figures, appearing burdened, trudge slowly, others dance to different rhythms. Joyous movement signals increasing personal freedom, as dancers begin to leap across the stage. At once historical progression and biography, the narrative clearly describes a story of racial oppression, further underlined by the performance’s sampled soundtrack which includes segments of Michael Kiwanuka’s “Black Man in a White World.” A sequence featuring a small band of dancers gathered in protest evokes civil rights actions of the 1960s, accompanied by the sound of angry dogs barking. Alvin Ailey’s own words are part of the soundtrack, drawn from a 1984 interview taken from ESSENCE: The Television Program. 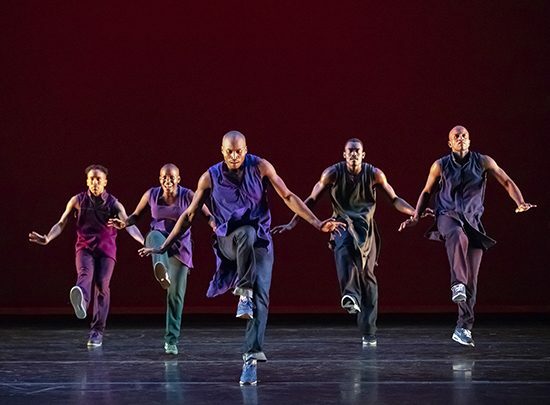 The impressive and contemplative debut, focusing on Ailey’s legacy, segues perfectly into a performance of the artist’s masterwork, “Revelations,” which originally debuted in 1960. A story told in three movements, rooted in African-American culture and music, the program is surely as electric now as when it debuted. “Fix Me Jesus,” a sequence that closes the first movement, is a beautiful and vital pas de deux. Jacqueline Green and Jamar Roberts savor Ailey’s urgent, passionate movements. Burnished in orange golds (lighting by Nicola Cernovitch), the flowing dresses by Ves Harper allow the full expression of Ailey’s striking choreography. Speaking on the current company during his prologue, Mr. Battle explained that “We’re not filling shoes but standing on shoulders.” The production shows just how sturdy those shoulders are, and how firmly planted the company remains at the center of modern dance. Running Time: About 2 hours with 2 intermissions. Alvin Ailey American Dance Theater runs at the Kennedy Center through Sunday, Feb. 10. For tickets or more information, click here. Programs vary every night.